With high crop yields in recent years, many producers wonder how much applied fertilizer is enough to hold soil tests at a desired value. Fertilizer ROI depends on the soil’s ability to supply a portion of a crop’s nutrient needs. Phosphorus (P) and potassium (K) follow a diminishing return for each additional pound of fertilizer applied, and since P and K are not mobile in the vast majority of soils, each nutrient can be found in relatively large quantities but only a small fraction of that total amount is available to plants. 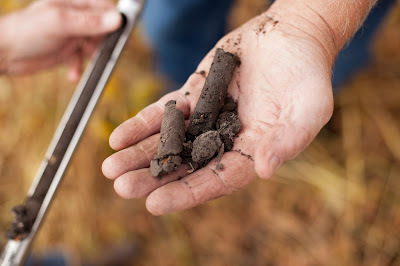 Here’s a look at some of the most common questions about soil tests and P and K management. As a farmer, how do I use a soil test effectively to manage nutrients? Think of the soil test as a probability function. It indicates the probability that a given nutrient for a given crop can be entirely supplied from the soil. The ranges used are conceptual, giving a Very Low, Low, Medium, High, or Very High probability the soil can supply all the needed nutrients for a crop. Maintaining soil test values in a given category can be difficult due to variations in crop uptake, which results in variations in P or K concentration in the grain and variable yield. Crop P and K removal values are calculated based on an average of a large number of samples. There is always some uncertainty in the exact amount of P or K in the grain, so it can be difficult to target the exact amount removed on an annual basis. Yield monitors have made it easier to track yield levels and estimate nutrient removal, but some uncertainties still exist around the accuracy of calculated removal values. The table below shows average removal of P and K for corn. Can the probability of response be quantified for soil test categories? In order to quantify the response probability and average yield for corn based on soil test classifications, University of Minnesota Extension, with funding from the Agricultural Fertilizer Research and Education Council (AFREC), established a series of research trials. The results indicate that the probability of response ranges from near 87 percent with a Very Low soil phosphorus test to 7 percent when the soil test is Very High. While there is still a slight chance for a yield response or a Very High soil P test, on average we would expect no more than a 0 to 1 percent reduction in yield with no P applied. Keep in mind that these values are averages, so there is always the chance of a profitable response but the chance decreases as soil test increases. 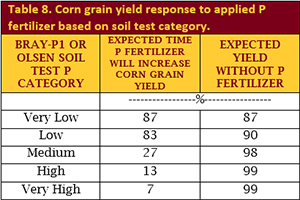 The following table shows field research data summarizing the expected percent of time where a measurable response to P fertilizer will occur and the maximum yield produced when no fertilizer is applied. If I have to cut costs, what are my options? The answer to this question depends on the soil test in a given field. If your field has High and Very High soil P tests, you can apply a low rate of phosphorus as an in-furrow starter fertilizer and maintain adequate levels for the year. With Low soil P tests, you will likely need to apply broadcast fertilizer P or K, which can provide a positive return on investment, as in-furrow starter cannot be applied at rates high enough to supply all the needed P or K for corn for that soil. Variable rate application of P and K can pay when it comes to ROI, however, profitability will be tied to your ability to increase yield in areas of the field that may be under-fertilized. Here you’ll be saving cost by reducing application of P or K in areas where the crop will not fully utilize what is applied. Bottom line, when it comes to ROI in fertilizer P and K, let the soil test be your guide.